Schwartz & Wade, 9780385373302, 40pp. Lumphy, StingRay, and Plastic—the toys from the beloved chapter books Toys Go Out, Toy Dance Party, and Toys Come Home—are back in a glorious full-color picture book, perfect for gift-giving this holiday season. 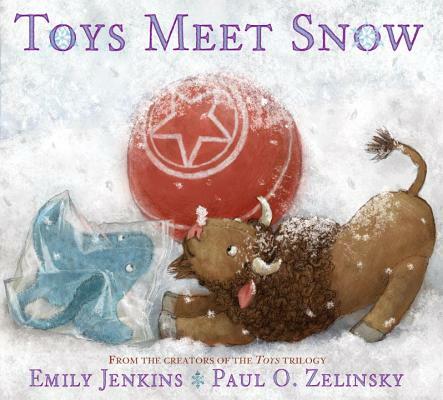 Acclaimed author Emily Jenkins and Caldecott Medal–winning illustrator Paul Zelinsky have created a book destined to become a classic. Emily Jenkins is the author of numerous award-winning picture books, including Water in the Park, a Booklist Editors’ Choice and a Bulletin Blue Ribbon Book; Lemonade in Winter, a Publishers Weekly Best Children’s Book of the Year; and two Boston Globe–Horn Book Honor Books: Five Creatures and That New Animal. She also wrote the three chapter books in the Toys trilogy: Toys Go Out, Toy Dance Party, and Toys Come Home. She lives in Brooklyn, New York. Learn more at emilyjenkins.com. Caldecott Medalist Paul O. Zelinsky is one of the most acclaimed picture book illustrators working today. He is the illustrator of Dust Devil by Anne Isaacs, a New York Times Notable Book and an Oppenheim Toy Portfolio Platinum winner. He received the Caldecott Medal for his retelling of Rapunzel and three Caldecott Honors for his illustrations in Rumpelstiltskin, Hansel and Gretel, and Anne Isaacs's Swamp Angel. He also illustrated the three chapter books in the Toys trilogy: Toys Go Out, Toy Dance Party, and Toys Come Home. Visit the illustrator at paulozelinsky.com.